Highlights from our Viking Sea Caribbean cruise definitely included this aerial tram ride. 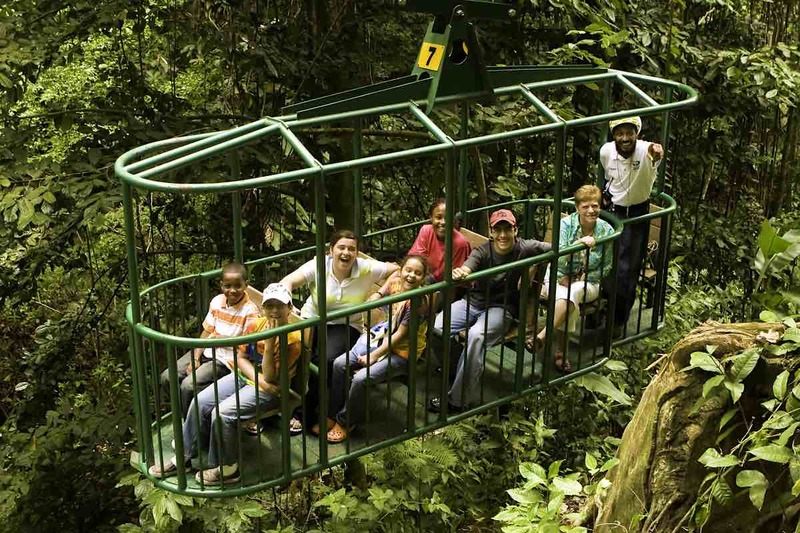 On a sunny 74-degree January morning, our 8-person open-air gondola quietly ascended into St. Lucia’s lush rain forest. Countless shades of green and a fresh, earthy scent delighted our senses and dispelled travel stress. As the live narrator’s voice explained what we were seeing, the only other sounds were the soft whir of hummingbirds and shrieks of delight from nearby zip liners. After gently gliding through the tree tops 80-feet above the forest floor, the tram gradually descended back to the loading area. Everyone in the tram were passengers on the Viking Sea, one of six Viking Ocean ships. Many of us had earlier cruised on a Viking river cruise in Europe. Launched in 2016, the contemporary 930-passenger Viking Sea has all veranda cabins with comfy king beds you can sink into, luxury linens, generous closet and drawer space, mini-bar beverage chiller, LCD TV and security safe. The ship is Norwegian themed with light woods, dozens of decor and cultural items, art works, books as well as their signature Mamsen’s gourmet deli. What’s not to like with a bathroom with a low entry step, heated floor and towel bars plus a glass shower stall? All cabins have a small espresso coffee maker, robes, slippers and 24-hour room service. If there’s a rare rainy day, look in the closet for a red Viking umbrella. Unlike other cruise lines, Viking ocean cruise fare includes one land excursion in every port, dining in alternate restaurants, Wi-Fi throughout the ship, port fees, as well as beer, wine and soft drinks with onboard lunch and dinner. Viking ocean ships do not have formal nights, photographers or art auctions. Children under age 18 are not allowed. Most of the adult guests are well-traveled retirees. With an extensive array of palate-pleasing food, gorgeous views and open indoor/outdoor seating, the World Café is a popular dining option. At dinner, choose from frog legs and sushi on one end and six flavors of gelato on the other—with an incredible number of light bites and dense delights in between. World Café is not crowded and there always is an open table. Breakfast features made-to-order eggs and other hot food items. Lunch and dinner frequently offer a carving station. Seafood, Greek, Mexican, Asian and other theme dinner items are featured throughout cruises. The Restaurant, the ship’s main dining room, has menus that change daily. Manfredi’s Italian Restaurant offers the finest cuisine from Italy’s treasured regions. The Chef’s Table provides a multicourse tasting menu with wine pairings. Enjoy eating by the pool? It’s hard to beat the Pool Grill’s juicy burgers and gourmet accompaniments. To keep guests healthy, Viking has special hand washing sinks with soap, warm water and cloth towels. In the afternoon, indulge in tea service with freshly made finger sandwiches, textured scones and delightful desserts. Live classical music enhances the ambiance. Although Viking Sea does not have a casino or elaborate floor shows, it has abundant musical entertainment. Throughout the cruise talented musicians and singers provided ongoing music options in the evenings as well during afternoon tea and other events. During our St. Lucia port visit, a local steel band gave a spirited onboard concert. Jenna, the popular cruise director with a friendly demeanor, is an accomplished singer whose announcements were consistently clear. Matt, the assistant cruise director, conducted daily Trivia contests and taught dance classes. Guest lecturers provided TED talks, history and culture lectures. Many of the smiling crew members hail from Europe. They receive extensive onboard training in the ship’s technology from TVs and coffeemakers to programmable washers. Even the bridge is automated and no longer uses paper navigation maps. The ship’s public areas include an infinity pool cantilevered off the stern, adjacent to World Café outdoor tables. The main pool features a retractable dome for year-round swimming and sunning. In the Spa, guests can use the Snow Grotto and plunge pool along with the sauna and steam room. There is no entrance charge for the Spa. Each deck has a launderette with programmable washers, dryers and irons. Viking’s West Indies Explorer 11-day itinerary offers a different island excursion every day with no sea days. Several islands share similar histories. Most of the island were under British rule and participated in the active slave trade. Today many of the islands are independent nations where tourism sustains the local economy. Several islands are still recovering from hurricanes, while others were not touched. In the British tradition, vehicles drive on the left side of the road. A variety of vehicles provide island transportation, often on narrow, bumpy 2-lane roads. Drivers honk their horns as they zip around blind corners and curves. Roundabouts are more common than traffic lights. Typical excursions include panoramic tours around the island, ascending to high viewpoints for photo ops. Then tours go to beaches, rum distilleries, culture centers, boat excursions and marketplaces. Visitors who prefer more active excursions can zip line, snorkel or hike on rugged terrain. Some of the West Indies islands on the itinerary are a haven for avid birders. Tortola, the largest of the British Virgin Island archipelago, has a beautiful setting amid gleaming azure waters. Famed pirates Blackbeard and Captain Kidd once lived here. For a time, Tortola’s sugar cane industry boomed. Today the capital of Road Town sits on a picturesque horseshoe–shaped harbor where yachts mingle with simple fishing boats. You can take a ride up the mountain in Tortola for a beautiful view of the sea. Although St. Lucia has the deepest harbor in the Caribbean, this lush green island did not have electricity until 1964. The French and British fought for control of St. Lucia for many years while sugar cane and bananas sustained the economy. Today tourism is the main source of income. Our tour guide said the chocolate in Hershey bars comes from St. Lucia. Because island visitors may encounter broken pavement and uneven terrain, take sturdy walking shoes. Some small buses have very steep entry/exit steps. For more information visit Viking Cruises.